Blown-in insulation is also referred to as “blow-in” or “blown” insulation. It doesn’t really matter which term you use. 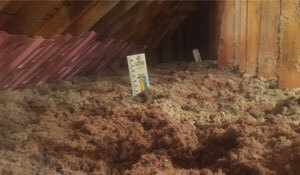 What DOES matter is the improved energy performance that blown insulation makes possible in any unfinished attic. According to the U.S. Dept. of Energy, most attics aren’t adequately insulated. A typical home is likely to have less than R-20 attic insulation. But throughout most northern states, the DOE recommends that attics in be insulated to R-49 or more. Call 1-877-757-1141 today, or Schedule A Free Estimate for our experts to prescribe the best insulation for your needs. Blown insulation is a great option when insulating an attic. The combination of too little insulation and too much air leakage can waste a great deal of energy. That’s why home performance experts recommend that air-sealing improvements be combined with insulation upgrades. When attic air sealing is combined with an attic insulation upgrade, it’s possible to reduce heating and cooling costs by as much as 40 percent. Wouldn’t you be interested in cutting your “comfort” costs nearly in half? If you have an unfinished attic, you’ll be surprised at how affordable it is to seal air leaks between your living space and the attic and upgrade attic insulation by having blown insulation installed. Both energy-saving upgrades can usually be completed in a single day. Some insulation contractors install blown fiberglass insulation, some install cellulose and some can install both types of blown insulation. Blown fiberglass and blown cellulose are both “fluffy” insulation materials with similar R-values. The installation method for blown fiberglass and blown cellulose is identical. A shredding and blowing machine located outside the house forces the blown insulation through a long, flexible hose that extends into the attic, where a technician directs the flow. Blown fiberglass and blown cellulose insulation can be installed directly over existing attic insulation, providing that this older insulation is in good condition. If you haven’t yet made this energy-saving investment, it’s definitely worth doing. Once it’s complete, there’s no maintenance to worry about. An insulation upgrade is a once-and-done improvement you’ll enjoy for as long as you own your house. We proudly offer a home energy audit to properly evaluate what areas in your home are the source of your comfort or energy problems. Once identified, we will provide the best solutions. Need attic insulation? 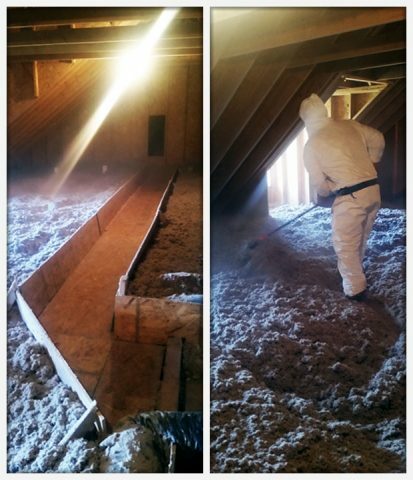 We offer Free Estimates for attic insulation and the use of blown insulation!